You read it right. This post is not about how to cook samgyupsal, but rather it's about how to 'eat' it right. 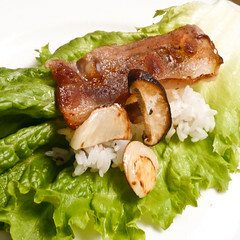 samgyupsal is a very popular Korean pork belly meat (similar to bacon), literally translated as three layered meat. 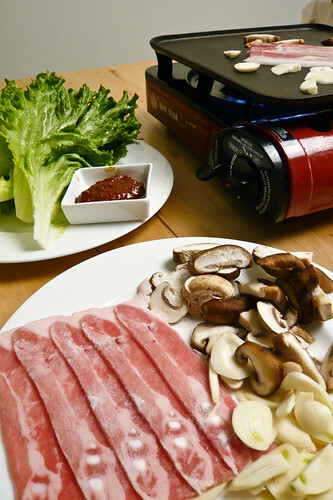 Like Korean BBQ, it is grilled on table top and served instantly. Knowing how to eat Samgyupsal will take you to another level of Korean dining experience. Grill samgyupsal, garlic, onion and other prepared vegetables on a griddle or a frying pan, if you don't have a Korean grill pan. 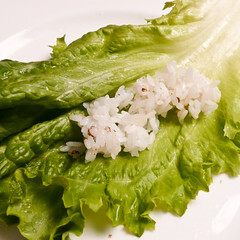 Place some rice on a leaf of lettuce. Place a well-done piece of samgyupsal on top. 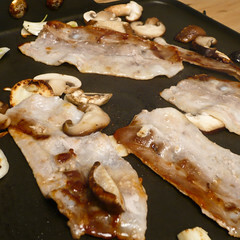 Add grilled mushroom and garlic.If you like, raw garlic is good, too. How about some Ssamjang, too. 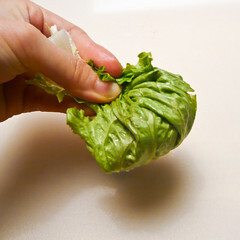 Wrap it carefully. Open your mouth as wide as possible. You know what to do next. Note: I had to turn off the smoke alarm twice while having these Samgyupsal at home. If you live in an apartment like I do, I advise you to leave the alarm off for couple hours and have all your windows and doors wide open while cooking. This is such a great posting. My husband and I also enjoy Samgyeopsal very much. 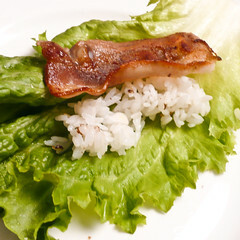 Please check out our video: http://www.youtube.com/watch?v=LhdDPpXwms0 Everybody was going crazy for Samgyeopsal on that day. So delicious! Thank you for sharing! Korea.net is the official website of the Rep. of Korea. For our “Blogging on Korea” section on our webpage, we pick nice and appropriate blog posts and introduce them to our visitors. Any blog posts related to Korea (Korean food, life in Korea, people, festival ..etc), we read thoroughly and feature it on our web for a couple of days. 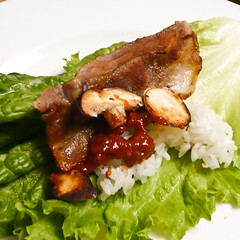 We’d like to outlink your blog post “How to eat Samgyupsal” on our web, so we can share it with our visitors. This is a great post, but where are the gochu peppers? oh i missed gochu peppers! Thank you for sharing this this must be useful. I remembered the first time i eat Samgyupsal, oh, imagine the bloopers! i didn't know what to do! It was really funny. I really enjoyed going through your posts.Thats true you know what you are talking about! Your site look is beautiful and easy to navigate. i love the recipe on sangyupsal..but i cant`t take it pork meat in my meals..so beef..should be okay??? Great post and very useful code! The info is very open and very clear explanation of issues. Nice! If there is an interest I have too much information that I can share with you. cooking Is my passion and i do cooking as a job and i can make so many dishes too.Nursing Dissertation support online | Law thesis writing service online | Finance thesis proposal help | thesis topics assistance uk | MBA dissertation writing service uk | Statistics dissertation writing service online. Awesome post ,All the given information is so informative for us ,I really appreciated from your information.I will bookmark it,and sharing it with my friends.Thanks.